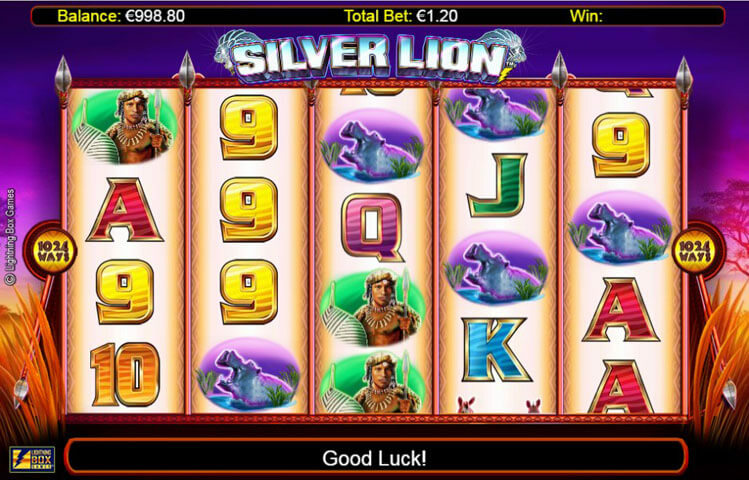 Silver Lion is one of the latest slot machines to be released by Lighting Box Games. The game has a five reel setup like most slots, and it comes packing a total of 1024 ways to win. This new game takes players on a wild adventure that takes place in the African jungle. It is where players will meet the Silver Lion, the main character of the game, as they enjoy an unforgettable ride while claiming plenty of the jungle’s fortunes as their own. The game is presented in wonderful visuals, equally outstanding sounds and offers players a one of a kind ride. Silver Lion has a 5 reeled setup, which is the most common format for most advanced video slot machines. Across the 5 reels of the game, players will take advantage of 1024 ways to win. This format is way more rewarding than the usual paylined-based video slots out there. Playing the game is done with ease as players can find the Spin button on the right side. As for the wagers, players can easily toggle between the different wagers by clicking on the settings button on the top right. They will find one betting option, which is the coin value. It results in a betting range that is between 0.40 and 280. Silver Lion takes players on a wild adventure in the African jungle. Therefore, players better be ready for a great jungle adventure as they join the Silver Lion, the African Tribal warrior and other animals from the jungle. Players will not only get to enjoy this wild adventure, as they will get to claim their own share of the golden fortunes of the African jungle. Since the game takes players to the African jungle, they will see that the reel set is located in the African jungle with nothing but the Savanna fields and the sun in the background. As for the symbols that will appear on the reels. They include the Silver Lion, the African Tribal Warrior, a zebra, a hippopotamus and colorful card icons. Silver Lion comes with an amazing set of winning chances and special icons. The first of these special icons is the game’s wild. This wild is none other than the Wild Tree. This wild tree will substitute for other regular symbols on the ways to win of the game to help players claim the biggest payout possible. The wild icon is not going to replace the other special icon of the Silver Lion slot. This other icon is the scatter Red diamond. Three of this scatter bonus diamonds would trigger the free spins round. Players can claim from 12 up to 20 free spins.